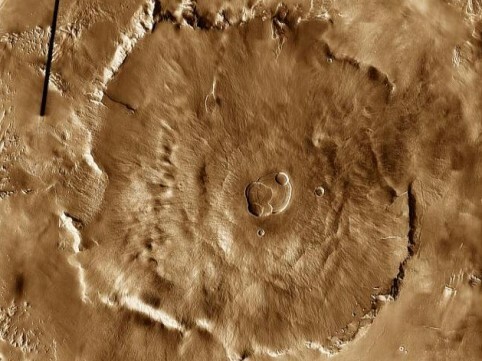 It’s volcano week, so it would seem like a lost opportunity to not write about the tallest volcano in our entire solar system, Olympus Mons – no-one said that the volcanoes had to be on Earth after all. 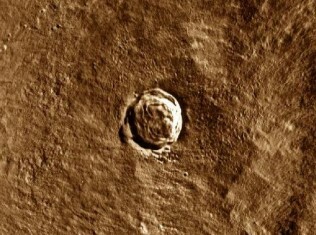 Normally, trying to tour the surface of another planet using Google’s services might cause an issue for us, but in this case we can easily go sightseeing thanks to Google Mars, a browser-based project launched in 2006 that found its way into Google Earth in 20091. Olympus Mons is estimated to be between 21,000 and 29,000 metres tall (69,000-95,000 ft). That’s around three times the height of Mount Everest, which also makes it the tallest mountain in the solar system, as well as volcano. The base is 624 km (374 mi) in diameter, which is about the same size as Arizona. At the summit are six or possibly seven overlapping calderas, 60 × 80 km (37 × 50 miles) across, and probably around 3km (2 miles) deep. We also know there are two impact craters from meteor strikes on the summit. 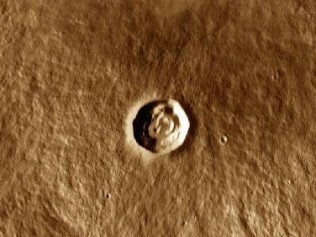 They are the 15.6 km diameter (10 mile) Karzok crater and the 10.4 km diameter (6 mile) Pangboche crater. Unless Google somehow extend their coverage to other solar systems, this is very likely to be the largest volcano that is ever posted to Google Sightseeing! 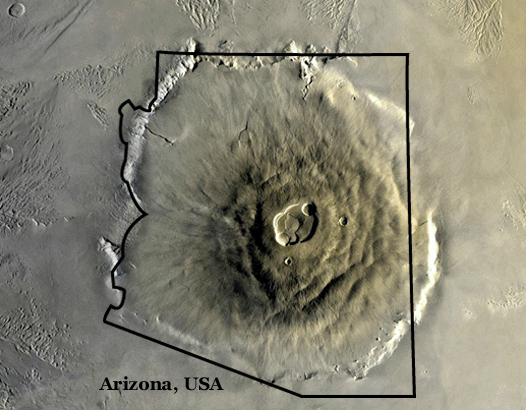 Read more about Olympus Mons at Wikipedia. 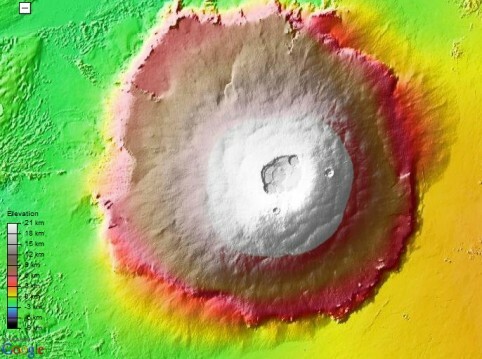 Well, calling Olympus Mons the tallest volcano in the solar system may not be correct. 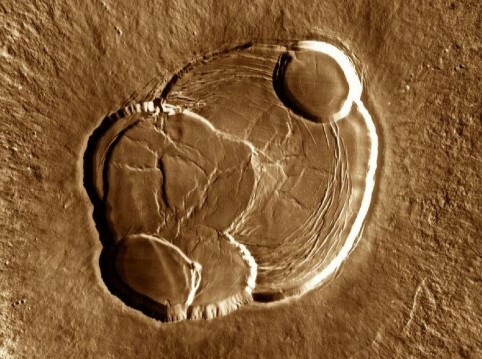 Tharsis Rise on mars is actually larger, but the debate continues about which on is bigger. How is height are mars measured? It certainly isn’t measured with respect to sea level. If Earth had no oceans, how high would Mount Everest be? Mount Chimborazo would be the highest when measured from the centre of the Earth, but Mauna Kea is the Earth’s tallest volcano when measured from the sea floor – over 10,000 metres tall (which is still a lot smaller than Olympus Mons even when measured from the Mars areoid). Given the diameter of Earth is twice that of Mars however, Olympus Mons starts to look a little titchy!